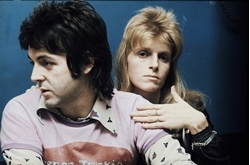 Remembering Linda McCartney With 7 Underappreciated Songs . Beatles Radio: The Beatles, Solos, Covers, Birthdays, News The Fab 4 and More! This week marks the 20th anniversary of the tragic loss of Linda McCartney, the famed photographer, activist and singer famously wed to Paul. She died at 56 on April 17, 1998 after a long battle with breast cancer, but she lives on through her memorable collaborations with her husband, whether solo Macca or in their collaborative band Wings. McCartney (née Eastman) was an editorial assistant/receptionist at Town & Country Magazine who learned the ropes on how to set up shots from her photographer ex, David Dalton -- and then jumped at the opportunity for her publication to shoot the Rolling Stones during a yacht party. Her talent was abundantly clear, and her career snowballed from there until she became the house photographer at the Fillmore East, getting classic shots of Aretha Franklin, Jimi Hendrix, The Who, The Doors, and other rockers of the day.